Panini Vision1 - Technology Unlimited, Inc.Technology Unlimited, Inc. 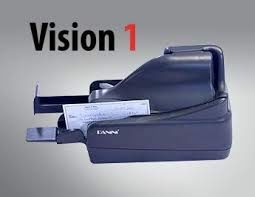 The Vision 1 is a single drop feed, high value version of Vision X for highly professional and user-friendly small-medium business Remote Deposit Capture or low volume Teller Image Capture applications. The Vision 1 is able to read MICR with top accuracy, capture superior quality duplex images (including TrueColor and FastColor) and physically mark items on the rear side via its one-line ink jet printer effectively positioning it for all circumstances where legislation, compliance requirements, or the Financial Institution’s preference imposes the use of rear physical item endorsement while simplified mechanics and no feeder consumables enable even simpler maintenance and increased cost savings.